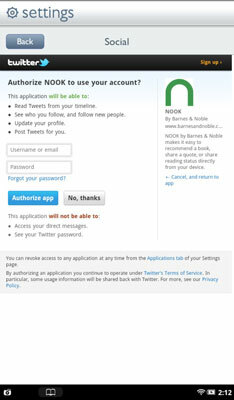 The pathway to the bells and whistles of the NOOK Tablet lies in the Reading Tools menu. Here is where you can move quickly through a book, search for something in particular, share your knowledge, or change the way the page looks. To display the reading tools, tap near the center of the page. Above these basic tools is a slider; it’s a gray line with a blue dot somewhere along its path. The location of the dot shows where you are in the book. To move forward or backward quickly, touch and drag the slider right or left. If you’re reading a book that someone has loaned you, a button at the right end of the slider lets you buy your own copy. If the book publisher has included this feature, you may see a small blue flag all the way to the right end of the slider. Tap that flag to see special options related to that book; you may see recommendations for similar books or content that’s included just with the eBook. To quickly jump to a particular page, tap the Go to Page button (between the reading tools and the slider). A numeric keypad will appear and you can enter a specific page number; keep in mind that page numbering is relative. If you have changed the typeface or its size, the book will reflow and page numbers will change. Contents. A list of chapter titles, sometimes with subsections. The current chapter is highlighted by a gray bar. 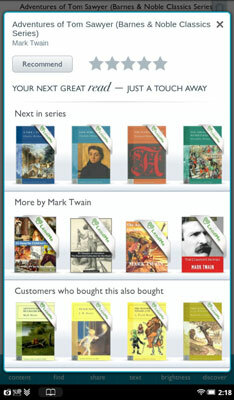 In most books you can jump immediately to a section by tapping the title or subsection name. Notes & Highlights. A list of passages that you’ve highlighted or written notes about in the current book. Again, you can jump to any of them by tapping the item. Bookmarks. A list of all bookmarks you’ve set in the current title. Jump to any of the pages by tapping its notation. Use the computer’s power to find a particular word or phrase anywhere in the book. Type a word or phrase you want to search for in the book. Tap the Search button in the lower-right corner of the screen. Recommend. Praise a book to friends and acquaintances by sending e-mail, posting a recommendation on your Facebook wall (or that of a friend who granted you that permission), or tweeting through your Twitter account. Post Reading Status. You can tell others how far you’ve gotten in the current book by posting a message on Facebook or Twitter. Rate and Review. Send your comments and a 1–5 rating for display on BN.com, or post your review on Facebook or Twitter. Like on Facebook. Proclaim to the world (or at least those who read your Facebook news feed) that you really, really like this book. Next in Series. Other books in the same series by the publisher. For example, choosing a book by Mark Twain published as part of a group of great 19th century literature might also show you titles by Charlotte Bronte and Nathaniel Hawthorne. More by Author. A listing of other books by the same author as the tome you are currently reading. Customers Who Bought This Also Bought. And so might you, B&N hopes.